Catch and release is a fact of life for all Nebraska anglers. You will either catch fish that you voluntarily release or you will be fishing on waters where regulations require you to release fish. If you are not convinced, do me a favor and take a few minutes to read this, http://www.nefga.org/web/article20080615.php . Regardless of the motivations, the benefits of releasing fish will never be realized if the fish that are caught and released perish from improper handling. So let me throw out some of my ideas on the best way to handle fish and get them back in the water with the best possible chance to survive. First of all, I will tell you that landing the fish as quickly as possible, handling them as little as possible, and getting them back in the water as soon as possible pretty much sums it up. That rule is the basis for everything else I am going to say. For example, I am NOT a fan of catching fish on light tackle just for the sake of catching them on light tackle. Yes, in some fishing situations you will have to “tackle down” to lighter lines and more natural presentations in order to get fish to bite. In those situations you gotta do what you gotta do. But you should try to use tackle that is heavy enough to control the fish you catch, because you do NOT want to spend 20 minutes or longer landing a big fish on light line. I know it happens, I know it can be done, but try to use tackle that will allow you to do the job effectively and efficiently by landing fish as quickly as possible. Years ago I would have told you that landing nets were hard on fish and if you wanted to release a fish you should try to land it without a landing net. I do not believe that is the case anymore. I have always been a fan of the rubber mesh nets or at least knotless mesh that is rubber-coated or treated. There are a variety of nets made by a variety of manufacturers specifically for fish that are to be released, http://www.beckmannet.com/ , http://www.frabill.com/store/landing-nets.html , http://www.stowmaster.net/default.asp . 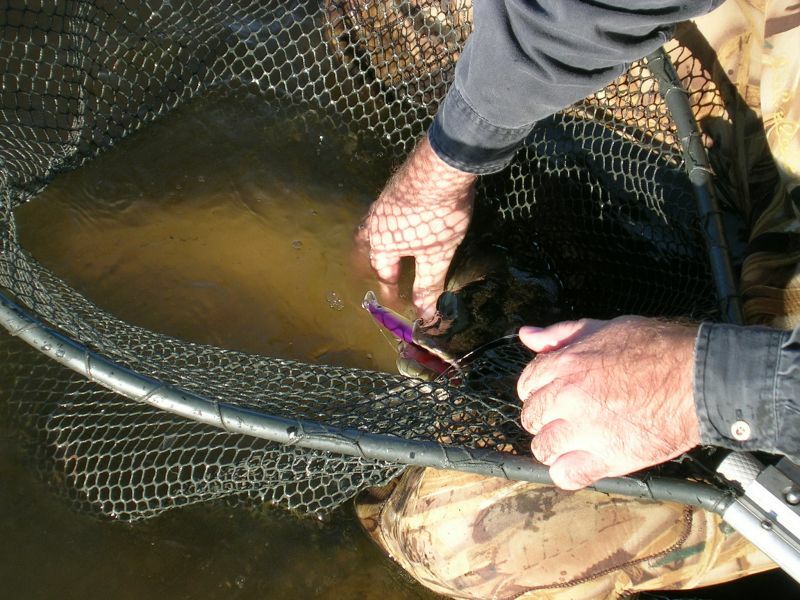 Landing nets are simply the quickest way to land a fish and control it. In addition once the fish are landed, they can be left in the net, in the water, while the hooks are removed and the camera is readied for a picture if wanted. 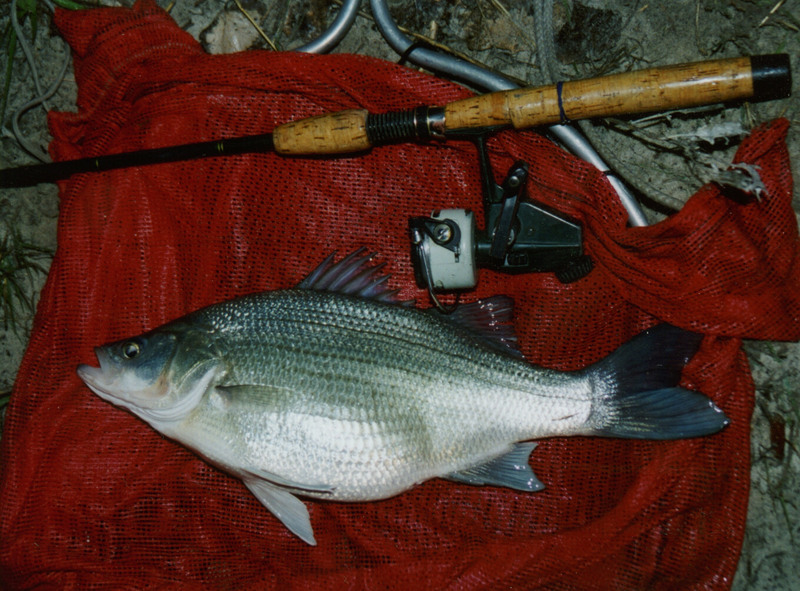 Handling of the fish can be reduced to as little as possible with the proper use of a good landing net. Oh by the way, do not ask me what I think of a certain professional bass organization’s handling of bass in their tournaments where they do not allow landing nets. Letting a fish flop on the bottom of a boat or on the ground, grass, gravel, etc. is not good. You all know that fish are “slimy” and that is because they have a mucous coating . That mucus helps protect the fish from infections and aids in the healing of any injuries to the skin. When you let a fish flop on the bottom of a boat or on the ground or handle them with dry hands, you remove some of that mucus coat and that can expose the fish to bacterial or fungal infections after it is released. As I have stated, leaving the fish in a landing net, net in the water, is probably the best way to handle fish, but what can you do if you have to take the fish out of the water and lay them down? Actually European carp anglers have developed some great techniques and products for handling fish. Some of the trophy carp they catch in Europe are literally caught, handled and released again and again over a period of years, so they must be doing something right. They have developed a variety of mats, cradles, slings and “corrals” where the fish can be placed (for example, look here, http://www.harrissportsmail.com/Categories.aspx?CategoryID=2221 ); all of those products are designed to keep the fish from flopping around on the ground or bottom of a boat. Now you might not want to fire off an overseas rush order for one of those mats or slings, but you might be able to adapt something you already have or can easily get. You can use a rubber mat as a fish handling mat (make sure to get it wet before placing a fish on it), or how about a soft-mesh laundry bag that you can buy at Wal-Mart? Big McConaughy white bass laying on my wetted, mesh laundry bag. I carry my fish/laundry bag with me almost all the time while I am fishing. If I have a big fish I want pictures of, I can quickly slip them into the bag and keep the bag in the water while I get the camera ready. If I need to place the fish on the ground I can quickly get the laundry bag wet and then lay the fish on top of it. Fish are made for life in the water. Their skeletal structure is not designed to support their weight out of the water. 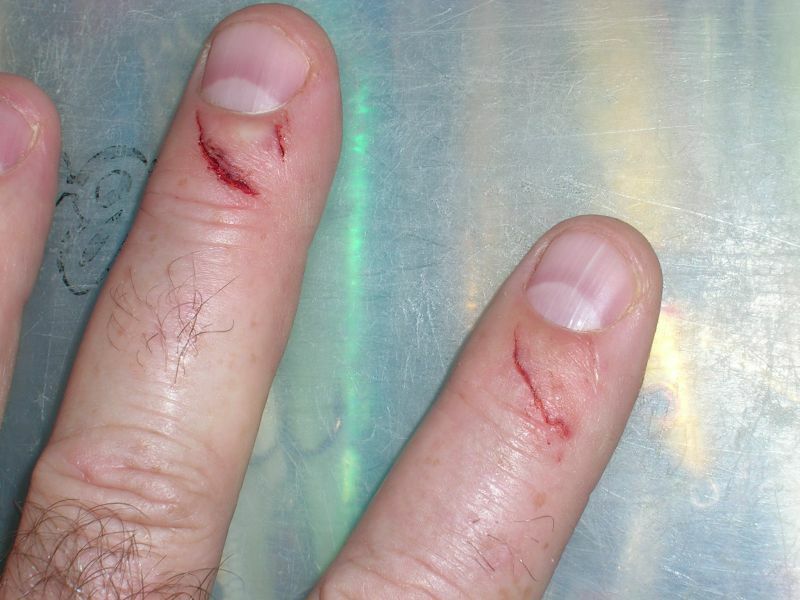 For that reason you have to be careful while handling fish. Generally, you want to keep them in a horizontal position as much as possible and support their weight with both hands. 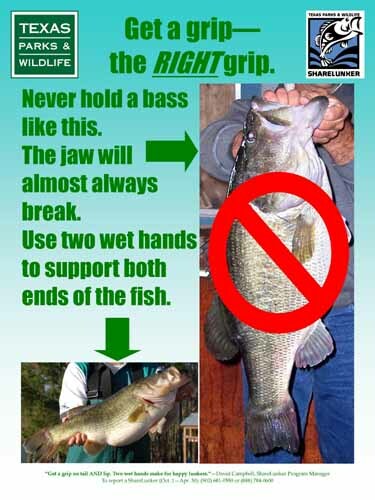 Now I am not saying that holding a fish by the lower lip in a vertical position guarantees that fish is going to perish; we all know that briefly, fish, especially small fish, can be handled that way with no harm. But the larger the fish, and the longer they are handled, the more important it is to support them in a horizontal position. Excellent poster from Texas Parks and Wildlife. Every angler needs to have some tools for handling fish and removing hooks. Those tools should be at the ready, at hand, at all times; you do not want to have to rummage around to find them when you need them. There are a variety of pliers, hemostats, forceps, hook-out tools and hook removers that are very handy for removing hooks. I cannot give you examples of all of them. I have a pair of extra long needle-nose pliers that is on my person at all times while I am on the water, and if I am fishing for panfish the forceps are on me at all times. Lanyards or “zingers” are good ideas for those tools so they do not get dropped in the water. Oh, you also should have some type of side cutters, hook cutters or bolt cutters too. At times it will be easier to cut hooks to remove them, and if you ever end up with a hook in your or your buddy’s flesh, you probably will want some type of hook cutters really bad! I have one of these tools, not sure it will work on the very heaviest hooks, but has worked great on everything I have needed it for, http://www.dbarb.com/ . I also like to wear a pair of gloves especially when handling large fish, toothy fish, and fish that have gill covers that can cut your hands. Again there are a variety of fish handling gloves on the market; pick the ones you like. I know some folks that use a pair of leather gloves, I have some neoprenes myself. Whatever the gloves, make sure they are wet before handling the fish. The gloves can protect you from injury and they can protect the fish from injury by allowing you to control the fish while handling it. 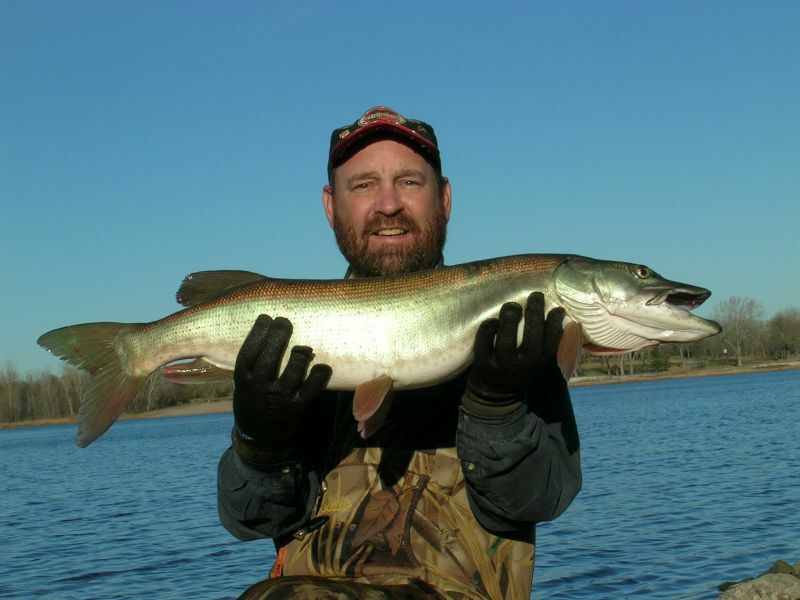 Here is what can happen when you do not wear the gloves while handling a muskie. I have additional scars from a previous encounter with a pike. Lastly, let me mention one other tool that I consider invaluable for removing hooks. That would be a good set of jaw-spreaders. Again there are several jaw-spreaders on the market, but I believe one of the best I have seen recently would be the ones made by Berkley, http://berkley-fishing.com/prod.php?k=266095&sk=266095&u=TLMS . 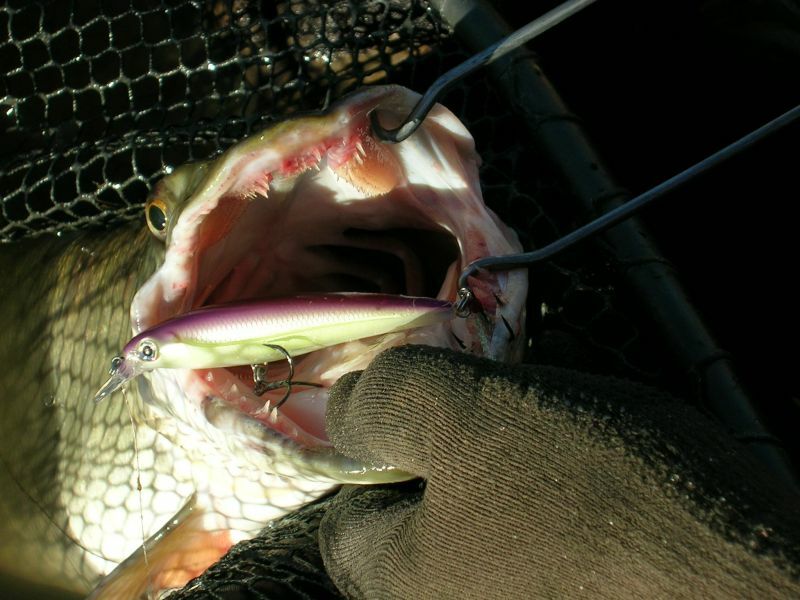 The jaw-spreaders Berkley has are designed to be easy on the fish, and they also have a lanyard to keep them from slipping into the water or worse yet to prevent a fish from flopping into the water with the jaw spreaders still in its mouth. Now you may be thinking that you do not fish for the big toothy predators and therefore do not need any jaw-spreaders. I would disagree because I have seen a number of predator fish deeply hooked, and a set of jaw-spreaders sure aid in getting those hooks out. 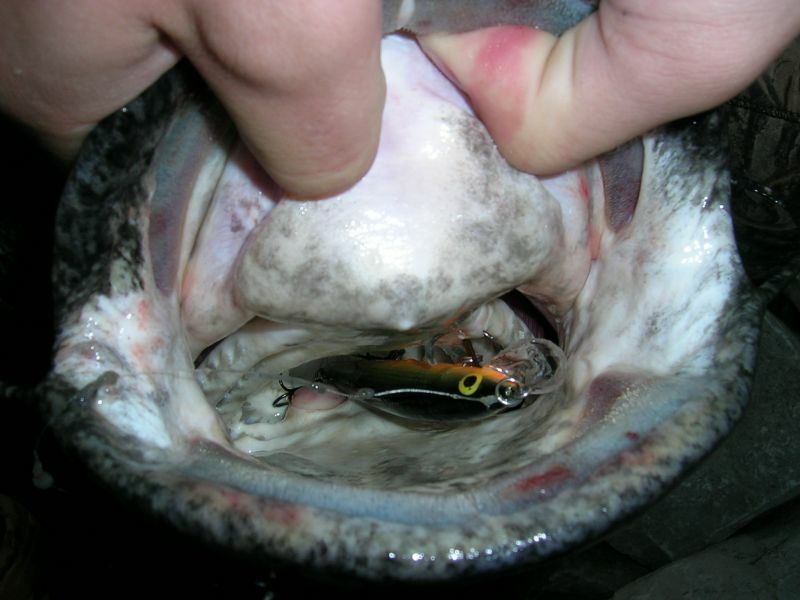 Flathead catfish that inhaled a Husky Jerk, "get the jaw-spreaders!" Those are some ideas for you. Again I will post the disclaimer that I am not sponsored by any company, nor have been asked to endorse anyone’s product. I am just telling you what works for me and hopefully those are some ideas you can use. If you have some other ideas or products that you like, I would love to hear about them!